It was back in March the last time After Action heard news about Shun White, one of Naval Academy’s most acclaimed football players in recent years. 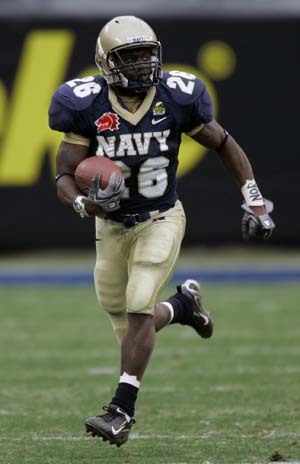 My journalistic cousins at Navy Times had reported back then on some of the questions raised by his contract with the New England Patriots and late graduation from the Naval Academy. Well, White has since been commissioned as a naval officer, and he’s now is serving aboard the destroyer Stout, according to an Oct. 14 press release on DVIDS. The Stout is taking part in “Joint Warrior 10-2,” a multinational excercise off the coast of Scotland, the release said. White, an ensign, is an anti-submarine warfare officer aboard the ship, and the author asked the former Navy star about ASW. Some in the fleet may have also seen White recently in NEX mailers, where his image is used to advertise Sharp Quattron flatscreens (link requires registration). Something seems wrong with your stats. How can you have a career yard per rush average of 8.9 but the best you did in a season was 8.3?